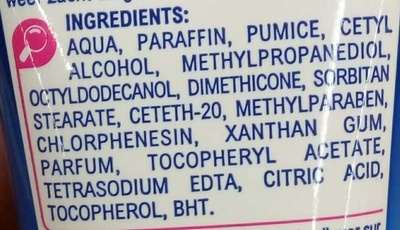 AQUA, PARAFFIN, PUMICE, CETYL ALCOHOL, METHYLPROPANEDIOL, OCTYDODECANOL, DIMETHICONE, SORBITAN STEARATE, CETETH-20, METHYLPARABEN, CHLORPHENESIN, XANTHAN GUM, PARFUM, TOCOPHERYL ACETATE, TETRASODIUM EDTA, CITRIC ACID, TOCOPHEROL, BHT. Product added on March 22, 2016 at 5:34:54 PM CET by sebleouf. Last edit of product page on April 6, 2016 at 3:23:35 PM CEST by .